Marya Lieberman, associate professor of chemistry and biochemistry at the University of Notre Dame, has collaborated with faculty and students to demonstrate advances in paper analytical devices (PADs) to test for counterfeit drugs. The promising low-tech solution has received broad attention in the scientific community. Lieberman’s work was featured in Chemical and Engineering News and presented recently at the American Chemical Society’s 244th National Meeting in Philadelphia. This past June, Lieberman and graduate student Abigail Weaver were invited to present at a workshop in Nairobi, Kenya. The Gates Foundation and Grand Challenges Canada funded the workshop that brought U.S. researchers together with African academics and policy makers to survey state-of-the-art diagnostics designed for use in low-resource settings — such as clinics that do not have reliable electrical power. With Weaver, Lieberman demonstrated paper analytical devices for detection of counterfeit antibiotics, anti-malarials and anti-TB medications. Although the PAD is not able to quantify the amount of each pharmaceutical ingredient present, it distinguished pure amoxicillin and amoxicillin that had been adulterated with maize meal in the Kenya workshop. Lieberman and Goodson are members of the Eck Institute for Global Health, which provided funding for Lieberman’s work in Kenya and awarded a graduate fellowship to Weaver. The American Chemical Society also supported Weaver’s travel through the GREET program. 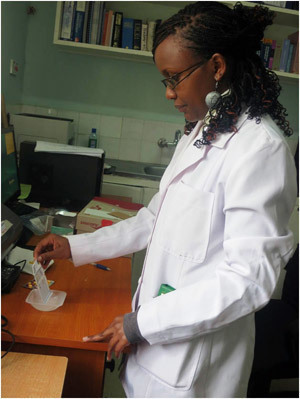 In the photo: A Kenyan pharmacist uses a paper analytical device to test for counterfeit drugs. Originally published by Marissa Gebhard and Gene Stowe at newsinfo.nd.edu on August 27, 2012.